I've updated Prime Links to use an ACP module to set options and was hoping to find people to help me test it. I've tested it on phpBB 3.2 but it should also still be compatible with phpBB 3.1. Modifies the attributes of links within posts (and/or private messages) based on whether the links are internal or external. This allows setting different classes so internal and external links look different, setting a target so links open in a new window, setting a nofollow, prefixing URLs such as to add an anonymizer or monetizer, and more. - Applied external link attributes to member website links on the viewtopic page, excluding the class attribute because the links here are represented as icons. - For assigning template variables to the member list page, I switched from using a core event that was new to phpBB 3.2 to one that existed since phpBB 3.1.7 so that this extension can still be compatible with phpBB 3.1. - Applied external link attributes to member website links on the memberlist page. - A warning about the regular expression /e modifier not being supported in php 7. Last edited by primehalo on Sat Apr 21, 2018 5:00 am, edited 8 times in total. Thanks, I'll make sure to update that. Can you further explain your suggestion/request? with this extension is it possible to put porpaganda link before the lins ?? nice job, Good to see you bringing your old mod to 3.2 will bring any more? Could you explain this further? I don't understand what you mean. 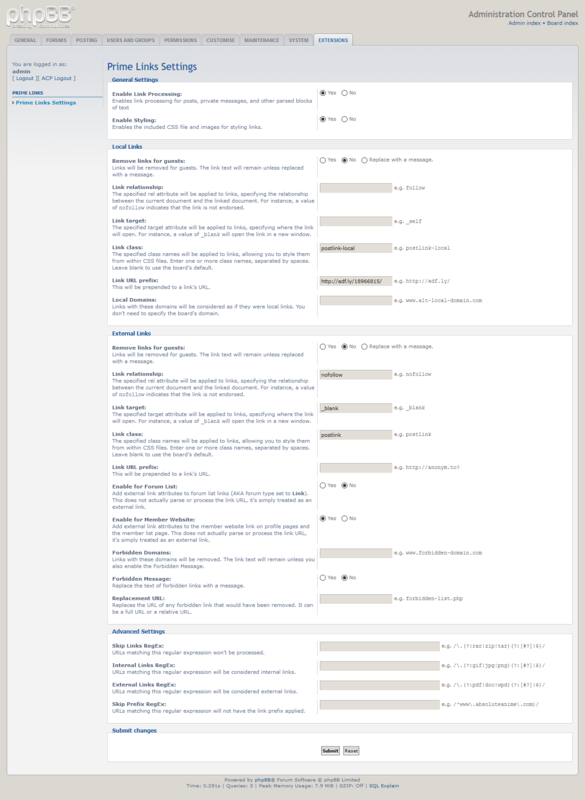 I would like to convert more of my extensions to phpBB 3.2 extensions. I uploaded v1.1.0 Beta 2 which addresses the issues and suggestions brought up in this thread. look, user posted a link, but to access his link who click will be directed to another link that will then be directed to the original link, does this extension do this? Sorry about that. I just fixed it. Congrats for this wonderful extension! - Prime Links does not manage "member website links" on profile pages, member pages and right colum in viewtopic (below the avatar). "Enable for Member Website" is enabled. In viewtopic.php, Prime Links does not manage the member website link under the avatar. It would be possible to do that and adding a rel="nofollow" into the anchor tag?